Since 2013, the New Jersey Turnpike Authority (NJTA) has been working on a series of projects to eliminate structural deficiencies, address substandard geometry and maintain coastal evacuation capabilities of the structures carrying Garden State Parkway (GSP) traffic over Great Egg Harbor Bay (GEH) and Drag Channel (DC). The Great Egg Harbor Bay is located in Cape May and Atlantic counties. The original GSP structures were reportedly constructed in the 1950s with two-lane structures carrying a single lane in each direction. In the 1970s, parallel structures were constructed, and northbound traffic was moved off the original structure and onto the new one, which allowed two lanes of traffic in each direction. 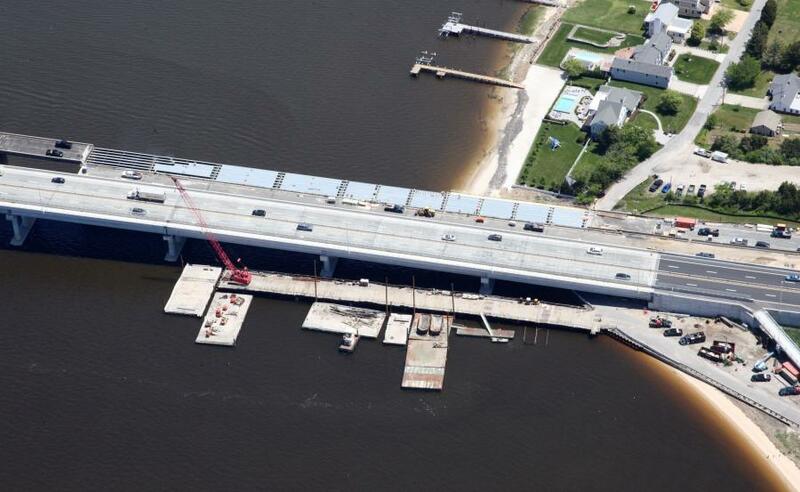 According to the NJTA, continued exposure to the harsh marine environment, increased volumes of traffic, and evolving design standards led to the need for a construction program that would provide safe and reliable passage across the bay for years to come. The first major contract (P100.251) involved construction of two new bridge structures to carry GSP southbound traffic on an alignment just west of the existing structures. The new structure over GEH is 3,834 ft. long, while the structure over DC is 770 ft. long. Both structures consist of pile support piers and abutments, pre-stressed concrete girders, and high-performance concrete decks. New roadway was constructed on the approaches and as a connection between the two structures on Drag Island. Route 52 Constructors, a Joint Venture of G.A. & F.C. Wagman Inc. and R.E. Pierson Construction Co. Inc., was selected as the prime contractor for the project with a low bid of $129,885,762.06. Work began in the summer of 2013, with Alan Houser (Wagman) serving as project manager, and continued through 2016. The final contract value was $139,723,593.95. The second and final contract (P100.300) involves rehabilitation of the existing northbound structures over GEH and DC, as well as demolition of the original southbound structures. The rehabilitation consisted of full superstructure replacement (bearings and deck) and substructure repairs on piers and abutments. The southbound structure was demolished below mudline or to a specific depth in deeper water. Those structures, of similar length to the new structures, consisted of short approach spans supported by wooden piles and long structural steel spans with pin and hanger connections in a girder — floor beam — stringer configuration. R.E. Pierson Construction Co. Inc. was selected as the prime contractor for the project with a low bid of $48,768,162.12. The Authority reported that the scope of superstructure replacement increased once the work was underway, resulting in a significant increase to the contract value. The final contract value is now projected to cost between $80 and $83 million. Work began in the summer of 2016 and is to be completed in the summer of 2019. Gary Riordan has served as the project manager for a majority of the contract time. "Working in a marine environment with tidal waters has its own unique set of challenges," said Ricardo McNeil, Project Engineer for the NJTA. "[These include] access to the work, movement of men and equipment, tidal flow, variable depth of water, sand bars, wind, etc. On top of that, each of these projects experienced an unforeseen condition that resulted in the need for additional work and impacts to the critical path schedule." During construction of the new southbound structures under contract P100.251, the contractor encountered scour protection riprap that had migrated from around an adjacent pier of the existing southbound bridge into the footprint of a new pier. The riprap interfered with the construction of a cofferdam and driving of concrete piles for a new pier. "That work was on the critical path, and time spent removing the conflict impacted the schedule for pile driving at that location as well as the schedule for erection of girders elsewhere, as both operations could be performed only by the largest barge mounted crane on the project," said McNeil. "Several weeks were spent to remove the riprap to clear the area so the planned work could proceed. Double shifts were used as the work had to be completed prior to the beginning of an environmental permit restriction of in water work meant to protect marine life." The contactor was granted additional contract time and compensation for the additional work performed. McNeil reported that the P100.300 rehabilitation contract encountered an unforeseen condition of its own. Crews preparing to paint structural steel to remain in place over the main channel found extreme deterioration of some members while cleaning the steel by sand blasting. "In response, a test span was designated and 100 percent of the surface area of the steel was cleaned to bare metal," he said. "Detailed inspection led to the determination that the steel should be replaced rather than repaired and repainted." This change increased the scope of demolition operations and subsequent superstructure (bearings, girders, and deck) reconstruction. Authority representatives and the contractor worked closely together to negotiate fair compensation for the work while maintaining the as-bid contract completion. Work is progressing on schedule and is expected to be complete by the summer of 2019. The Authority noted that the design of the new southbound structures and roadway incorporated a pedestrian friendly walkway. A 10-ft. wide multi-use path with a fishing bump-out was built adjacent to the travel lanes. A concrete barrier separates the path from the high-speed traffic and an ornamental fence on top of the barrier minimizes potential for cross-contact in an aesthetically pleasing way. Construction permits required long span lengths to achieve the navigable channel width prescribed by the U.S. Coast Guard. Spliced, prestressed concrete girders of variable depths were chosen to meet the requirements. Seven precast segments were erected in a line and post-tensioned together to make one continuous girder for each of the seven girder lines supporting the three-span deck unit. The rehabilitation of the northbound bridge will result in a structure consisting of the original substructure and a new superstructure. The original northbound bridge was comprised of precast concrete box beams with asphalt overlay and safety barrier meeting design standards in place in the 70s. The new superstructure has been reconfigured and comprises steel beams, exposed reinforced concrete deck slabs, and a taller safety shape meeting current design standards. The structural steel in the area of the main channel was designed to provide additional clearance over the navigable channel while avoiding the need to reconstruct the supporting piers. The number of girders used to support each span was increased while the depth of the girders was reduced to provide the additional clearance. Bolsters were added to each end of the girders to transition down to the original pier cap. 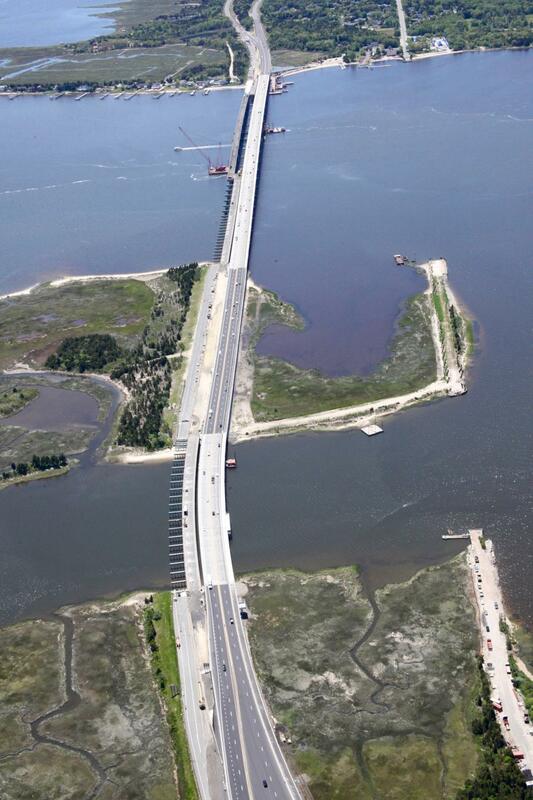 The design and resulting shape complement the adjacent spans of the new southbound bridge. "The contract completion date is in the late spring of 2019 and absent unanticipated delay the contract should meet that date," McNeil said. At the end of September, the P100.300 contactor was working on placing concrete for the deck on the main channel spans. McNeil reported that as that work continues, a safety barrier will be constructed and bridge lighting will be installed. The surface layer of asphalt will be removed from the roadway approaches and a new asphalt riding surface will be paved. Major subcontractors for P100.251 included A.E. Stone, asphalt paving; Assuncao Brothers Inc., parapet, sidewalk, and approach slabs; Bayshore Rebar, reinforcing steel; Diehl Electric, roadway lighting; and J. Anthony, stay-in-place deck forms. Major subcontractors for P100.300 include Archer Steel Construction, bearings, girders, and expansion joints; Assuncao Brothers Inc., parapet; Bayshore Rebar, reinforcing steel; Diehl Electric, roadway lighting; and Structural Services Inc., stay-in-place deck forms. Equipment used on the program includes several tug boats and sectional barges on the order of 60,000 sq. ft. In addition, cranes in use include a Manitowoc MLC300 w VPC max (variable position counterweight), a Manitowoc 4100 Ringer; two Manitowoc 2250; two Kobelco CK 2000II; two American 9299; one Kobelco CK 1600; one Manitowoc 12,000; and one Manitowoc 10,000. Several pile driving hammers also are in use. Excavators include one Caterpillar 245 long reach; one Volvo 700 with 17,000 lb. NPK hoe ram; two Komatsu 490 with 10,000 lb. hoe rams; one Komatsu 360 long reach; one John Deere 300G with hydraulic thumb; and two Komatsu 390 with 7,500 lb. hoe rams, grapples, and shears.